My hosts have made me so welcome it’s really great. Lina and her husband Anglis (this is probably spelt awfully wrong, but will check tomorrow…) made me a great breakfast of traditional porridge like stuff, but this one was made with barley grits, there was also bread and cheese and yoghurt. Lovely. We then headed out into the town centre. Today, luckily enough, is one of Lithuania‘s Independence Days. This one commemorates the first independence of 1918. 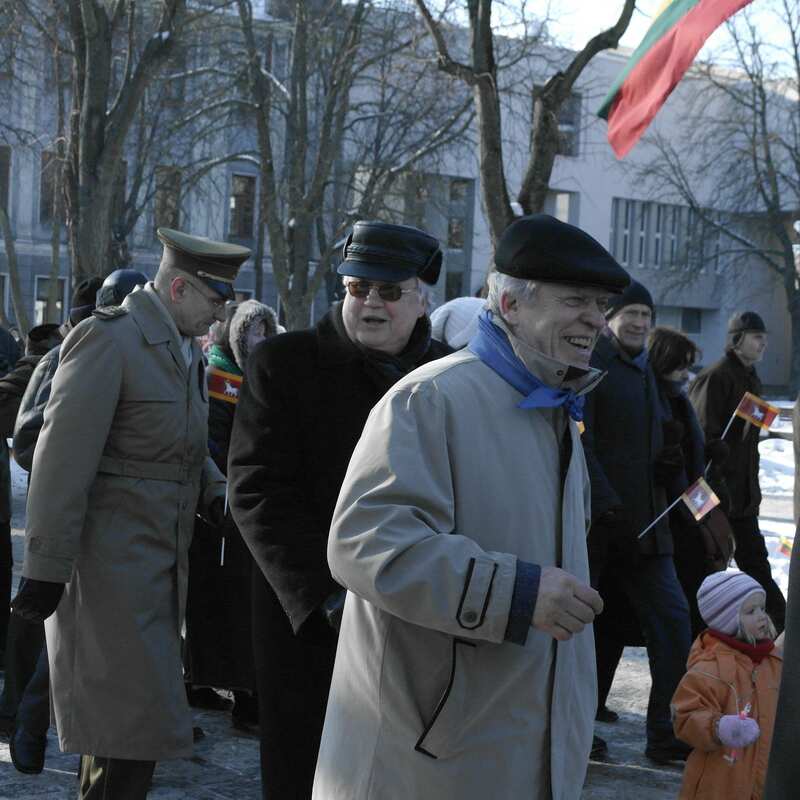 There was a parade with flag-bearers and little brass bands, and then a in the centre of town there was a big stage set up with traditional songs being sung, the national anthem, flags everywhere and people dressed in military uniform or traditional Lithuanian dress. Some of the material pattern of the skirts is quite similar in design to that of the Scottish Tartans, and this Scottish link seemed to be a theme of the day today. Anglis is currently thinking about applying to study a Masters at Glasgow School of Art, where I studied. People were often buried in mounds much like the Scottish ones, and even sometimes with cairns or structures built on top. There is a type of Bull, now extinct that makes up part of the Kaunas Flag, which, it would seem may be similar to the Highland Cattle in some ways, though this is just a presumption. Even tonight we ended up playing cards with some pack advertising a Scottish Whisky! Anyway, during the events of the morning we popped into the war museum, which although free today, is mostly shut as they are currently renovating / restoring many of the exhibits, it won’t be fully open again until the summer. 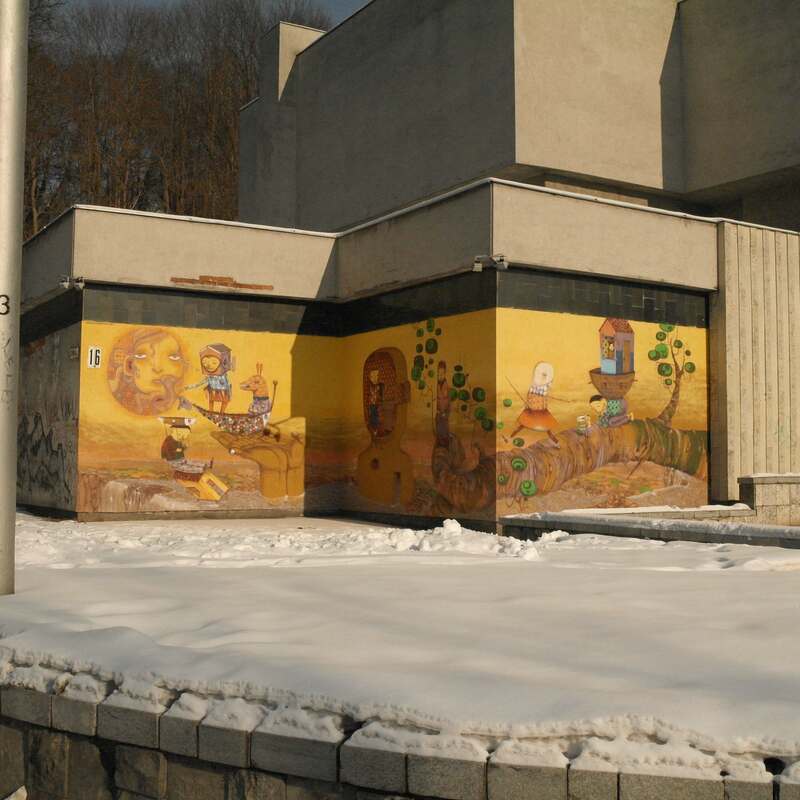 We then went towards the Kaunas Picture Gallery, which houses various works, but what I am most interested in seeing is the Jurgis Mačiūnas FLUXUS cabinet. Alas this was also shut until the afternoon, partly due to the festivities, but also because today the award for artist of 2011 was being presented. I will try to go back tomorrow and check it out properly. A few days ago it was Lina’s Birthday and so today many of her family were coming to celebrate and get together over food and drink. We popped into the supermarket, bought some stuff then headed back to the flat to prepare some food. I made sandwiches, nice and traditional Salmon and Cucumber triangle classics! whilst they others tidied the flat up for the arrival of the parents. They all soon started to arrive and we began to gather around the table, a buffet style spread was set up and everyone helped themselves. The atmosphere was lovely, the sun was shining through the beautiful wide SW facing windows and everyone was having lots of laughs. We ate, and drank for, basically, hours! We then started to play a board game called DIXIT. For her birthday Lina’s mum had made her the game, which looked to have taken a lot of work as there are many cards involved and lots of little elements. I won’t try to explain the game as it will probably take ages and not make any sense, but it was good fun, and I think my team came second out of six, so not a bad result! We then had some tea and coffee, Anglis’s Dad had brought some of his home mixed tea, a good home grown mint, mixed with a little Green tea. It was lovely, delicate mint flavour, and the perfect after dinner drink, especially with the extreme gluttony that had just taken place!